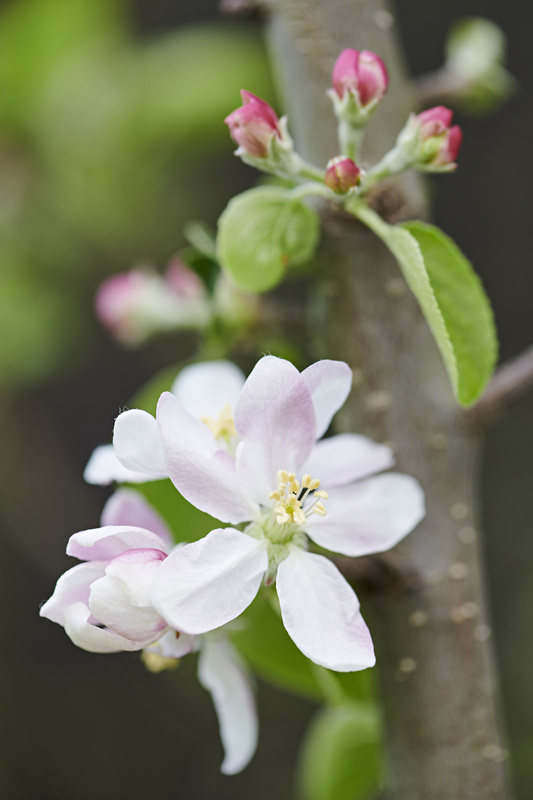 First fabulous blossoms, then a full crown of leaves, and finally fruit in summer and autumn - fruit trees offer it all. 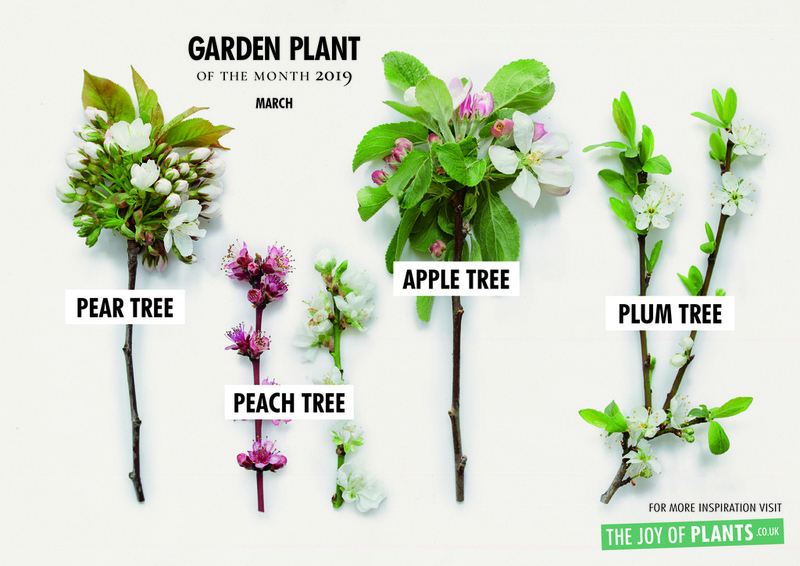 The apple tree (Malus), peach tree (Prunus persica) and plum tree (Prunus domestica) all fit perfectly with consumers’ growing desire to know where their food comes from and the ongoing enthusiasm for pick-your-own food plants. It is also educational and fun for children to see an apple, plum or peach develop. 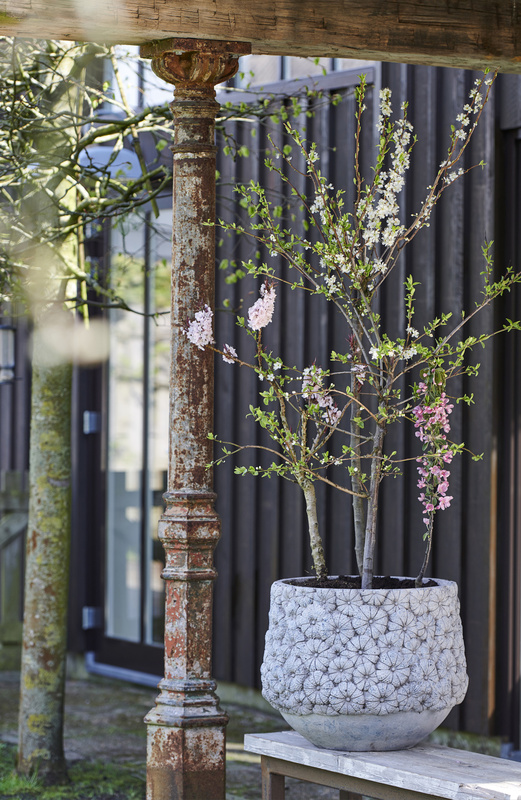 Blossom trees are available for gardens that have room for an entire orchard, but there are also small compact blossom trees that fit perfectly on a patio or balcony. 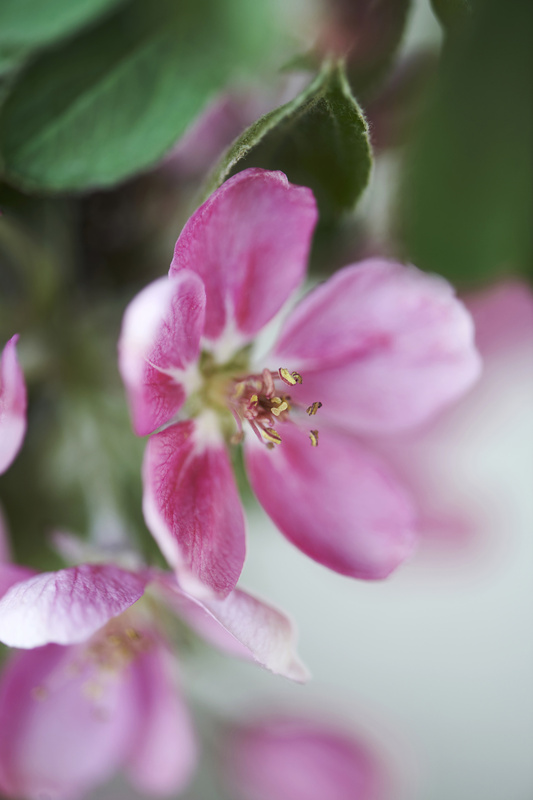 All Blossom Trees are grown in temperate regions in the northern hemisphere. The apple tree and plum tree originate from central Asia, whilst the peach tree comes from north-west China and were brought to the West along the old Silk Road. They have all been part of humans’ surroundings - and diet - in Eurasia for centuries. 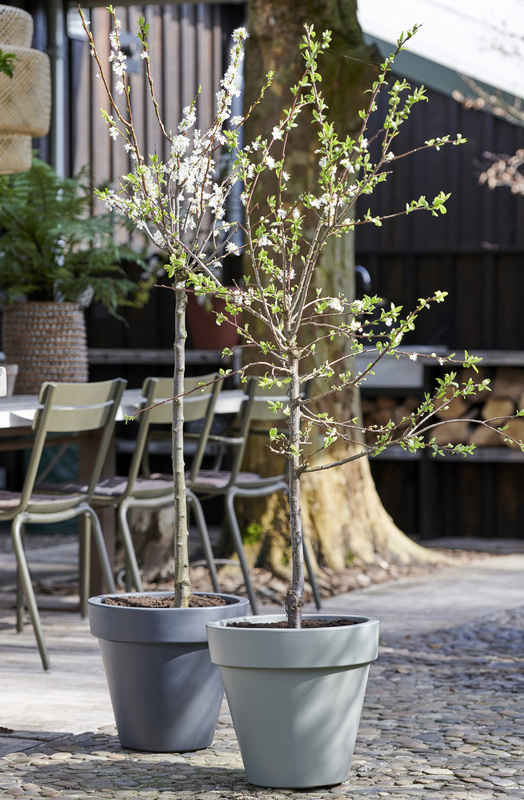 Blossom trees are offered in many different cultivars. As a tree they are very similar: a fairly short trunk, blossom, followed by a full crown with fairly pointy dark green foliage and then the fruit. There is plenty of choice - there are dozens of apple, plum and peach varieties to choose from. 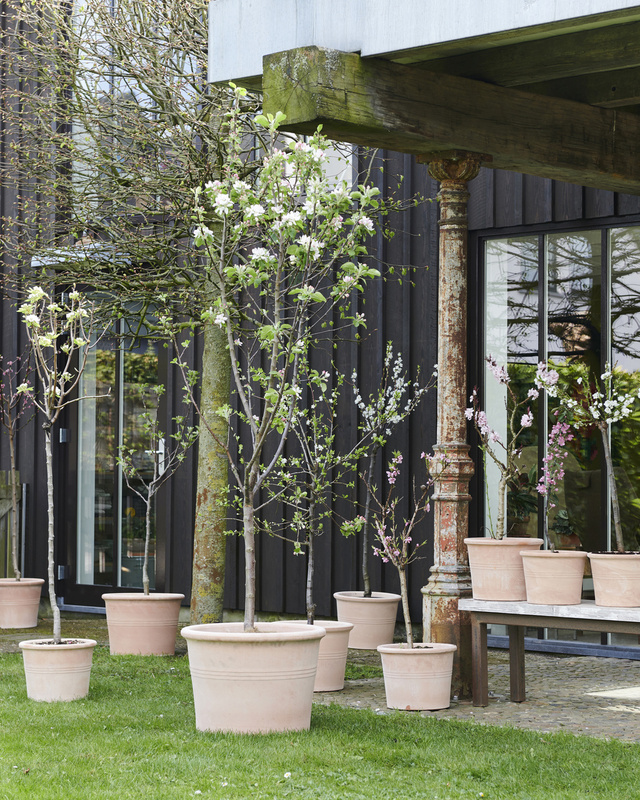 Anyone who doesn’t have space in their bedding area, has the choice between espalier, half-standard, standard and patio tree. 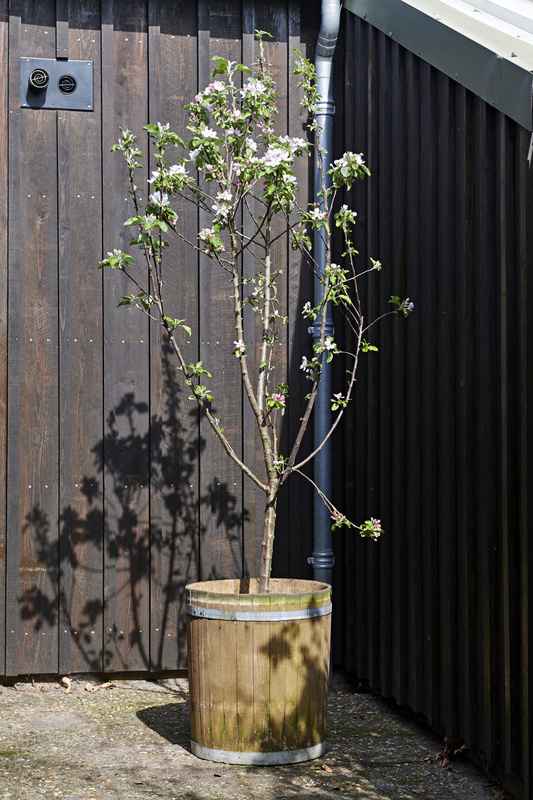 There are also ‘family trees’ available where different varieties of apple, plum or peach appear on a single tree. • Pot size, structure and branching must be in proportion. • The fruit tree must be well-rooted and firmly rooted in the pot. • At the start of the season they must be offered with blossoms, and later in the season, with fruit. • The plants must be free of caterpillars, snails, aphids or other pests such as mildew or botrytis. 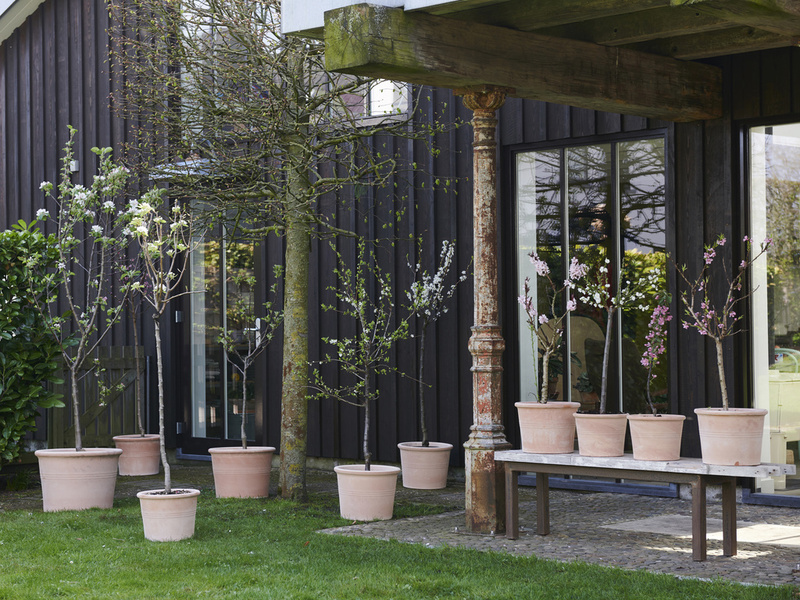 • Blossom trees like to be placed in the sun with some partial shade during the day as well. • Plant a blossom tree deep so that it is firmly secured in well-draining soil. • Give plenty of water immediately after planting, then water normally after that. • Give organic fertiliser once a month during the flowering and growing period. Outside that period you only need to feed once per season. 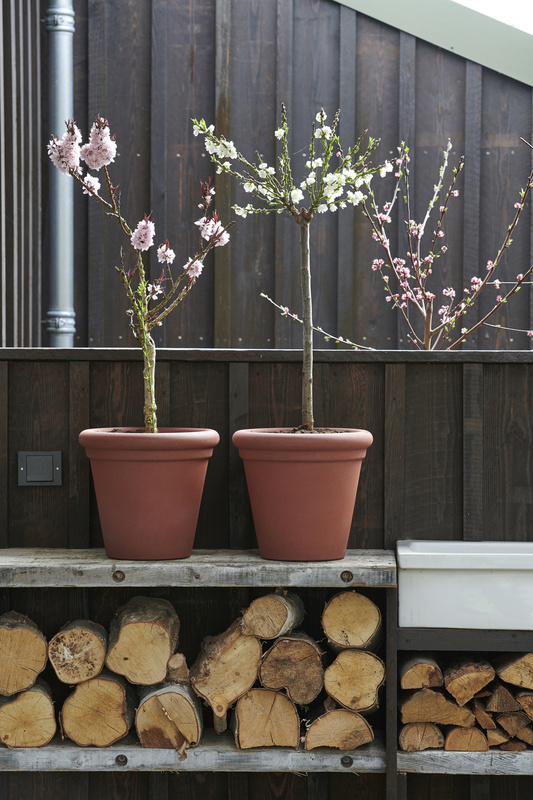 • Prune apple and peach trees in March, immediately after winter and before flowering. Plum trees are best pruned in late summer after harvesting. • Blossom and night-time frost? 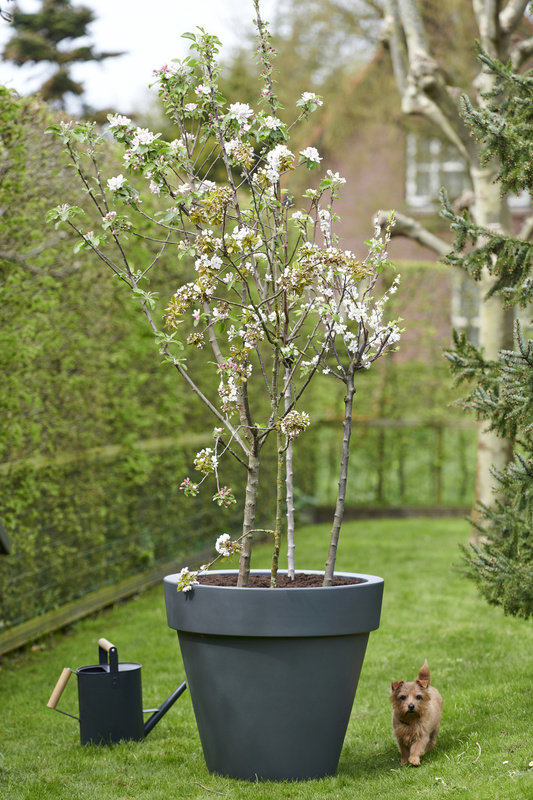 Cover the tree with fleece or spray the blossom so that it freezes temporarily. This will give you a good chance of harvesting fruit later. 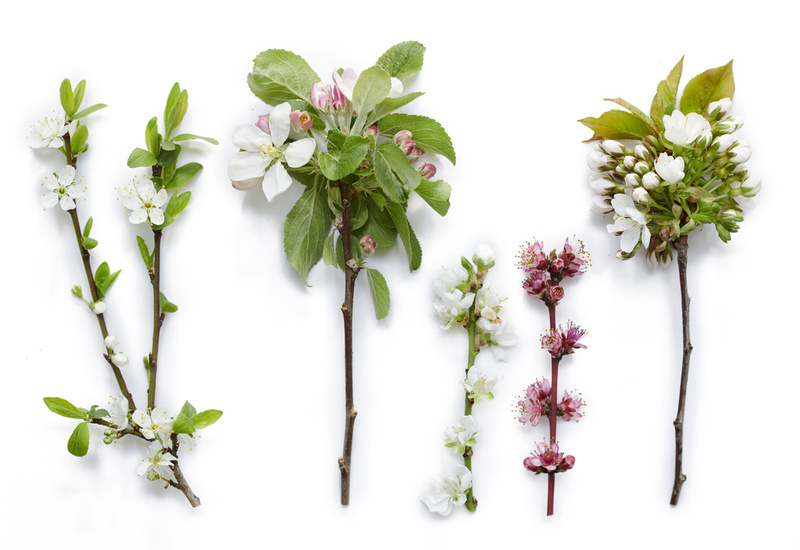 Nothing delivers that spring feeling like a fruit tree in blossom, particularly with an inspirational poster (which can be downloaded below) as the backdrop. 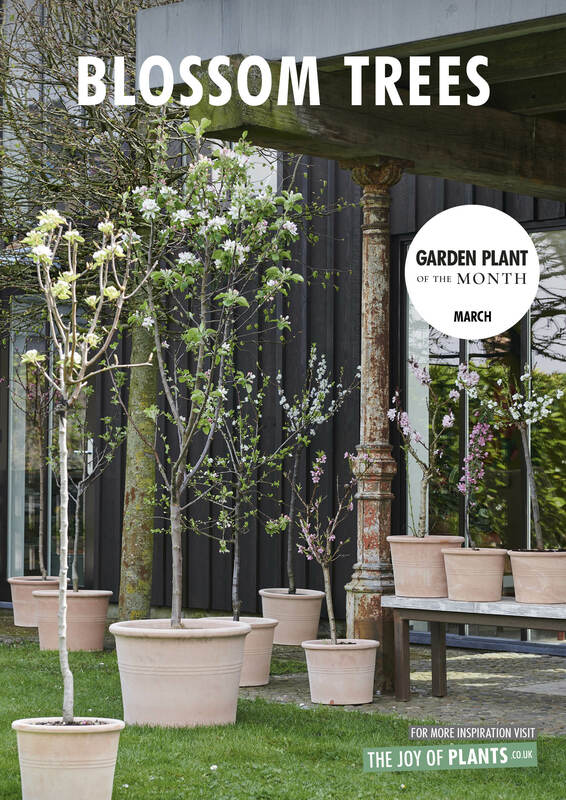 Sales boosters in the early season are potted bulbs and January’s Sleeping Beauties, and February’s Spring Surprises to help present the entire spring season range together. 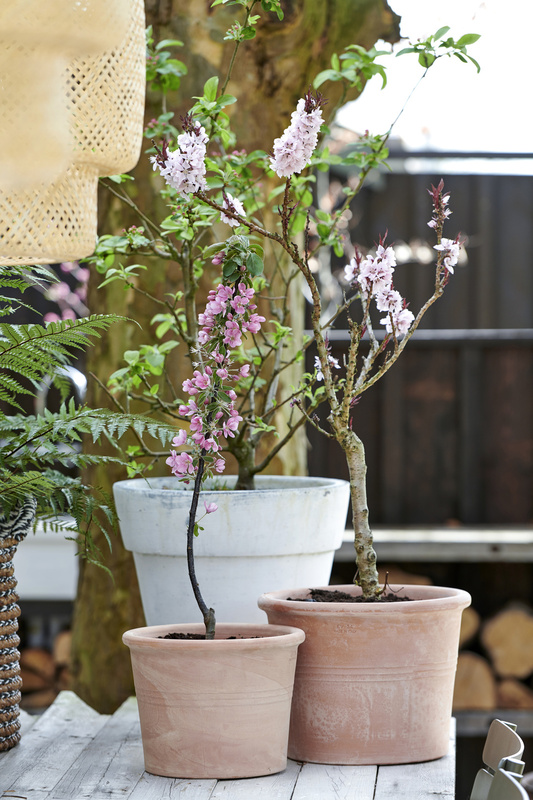 Supplement them with potted bulbs and evergreens to create a fresh, green atmosphere. Further on in the season when there are small fruits to be seen, blossom trees can be made even more tempting by including regional produce in the display. This can result in a profitable collaboration with local farm shops and inspire customers to make compote, juice or jam from their own harvests.